(Photo: Gregg Brekke / WCC)Joining voices, FBOs committing to act against HIV and AIDS and TB on Sept. 27, 2018 in New York. 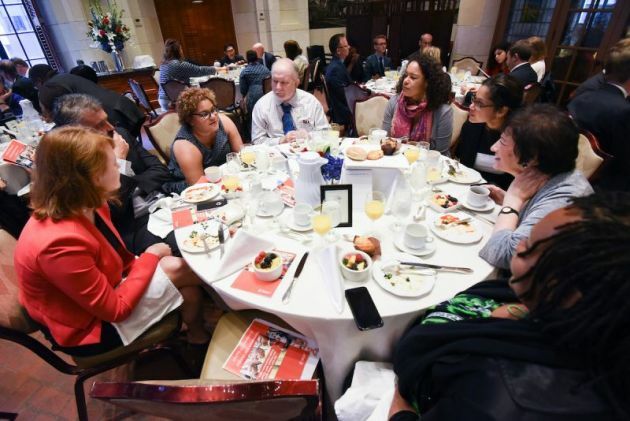 Faith leaders and health service providers from across the world have gathered in New York for an interfaith prayer breakfast, to join their voices and commit to combat the spread of HIV and AIDS and tuberculosis in children. The Sept. 27 meeting was organized by the World Council of Churches – Ecumenical Advocacy Alliance (WCC-EAA) in collaboration with UNAIDS, PEPFAR, and the UN Interagency Task Force on Religion and Development (IATF). Gregg Brekke reported for the WCC that the breakfast followed a Sept. 26 meeting of the United Nations General Assembly in New York. It met under the theme of "United to end tuberculosis: an urgent global response to a global epidemic," at which UN member states adopted a Political Declaration on Ending TB. In many countries of the world, especially in developing areas, church-run medical institutions are at the forefront of the treatment of these serious diseased and church communities assist the victims and their families, but faith groups have been asked to do more to fight the stigma that HIV and TB carriers face. "Today we want to be in mutual support of one another, to strengthen old relationships and to forge new ones so we can truly improve the health of the world's children and the world's teenagers," said Bishop Mary Ann Swenson, vice moderator of the WCC's main governing body, its central committee. "Let's consider today some concrete action that we can take together, and that is pretty with our hearts and with our feet as we find ways to offer abundant life for all of God's children," Swenson said. In its 2018 World Tuberculosis Report, the World Health Organization said, "Worldwide, TB is one of the top 10 causes of death." Participants at the breakfast are those who historically called on their national governments to respond to HIV, and whose advocacy and influence have contributed to the establishment of PEPFAR and other funding streams for HIV and TB. Survivors of multi-drug resistant TB brought a powerful sense of urgency and reality to the discussion. "I'm grateful to those within the faith community who have held us accountable," said Dr. Deborah Birx, U.S. ambassador-at-large and head of PEPFAR. "They said, 'For all of your accomplishments, you missed half the children. For all your accomplishments, children are still dying of TB because you haven't found them.'" Tuberculosis, an infectious disease that generally effects the lungs, is a silent killer. Roughly one-third of the world's population is infected with tuberculosis bacilli but only one in 10 persons infected will develop active TB. Emotional testimony by Dr. Dalene Von Delft relayed the importance of early diagnosis and urged continued research for drug development. "I saw on the X-ray the big hole in my lung and thought, why did I get multidrug resistant TB? I had dedicated my life to caring for people," she said. "Later I was fortunate to get on a trial of the first new TB drug in 40 years, it saved my life and I can now continue to speak and advocate so that many more can live." UNAIDS executive director Michel Sidibé urged attendees to continue the work they accomplished in HIV/AIDS awareness with a renewed focus on children and adolescents vulnerable to TB. "We need each other; faith leaders, please help us to end stigma and discrimination," he said.